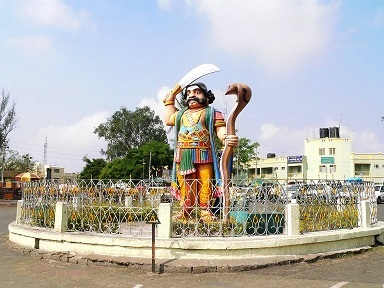 Chamundi Hills is around 12KM from the Mysore city center. One could either use public transportation from Mysore bus stand or use your own transportation - buses to Chamundi Hills are very frequent. The hills are at an elevation of around 1,000 meters affording panoramic views of Mysore City and vicinity from several spots. Getting there by car is fairly straight-forward and there are plenty of direction markers to guide you. We had an early Breakfast at Parklane (mainly South Indian options - Masala Tea is an indigenous version of regular tea served across the country - it has a lot more milk and is spicy - we found it OK although it is definitely an acquired taste) and left for Chamundi hills by around 8AM - the roads were practically empty once we were out of the city area. On approaching the hills, there are directions for Nandi Bull - the road is narrow but the marker clearly seems to indicate the road is accessible - but, a guy at the diversion said it was one-way and so we opted to visit the temple first and took a diversion (one mile) to Nandi Bull on the way back. The name Chamundi comes from Goddess Chamundeswari who according to legend killed demon Mahshasura, the king of the area covering present-day Mysore. Chamundeshawari Temple in the same area is dedicated to Goddess Chamundeswari. 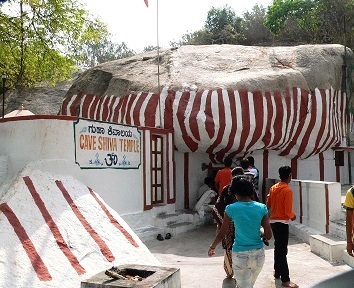 The main attraction for tourists is the 1,008-step stone stairway that leads to the top of the hill. The statue of Nandi the bull is enroute - the steps and the bull were first constructed and erected around the mid-seventeenth century by Dodda Devaraja Wodeyar, the Monarch. 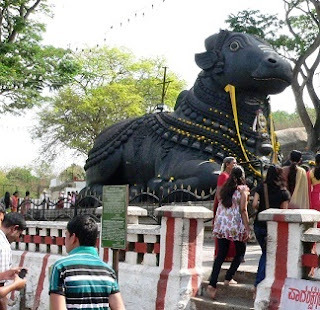 Rather than climbing all the steps in one go, an alternate path is to climb till Nandi statue and then go down the road from there to the other side of the hill and climb to the top from that side. 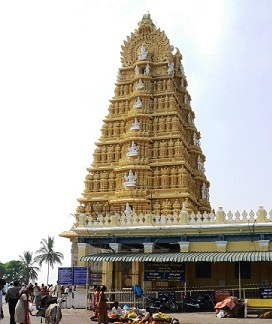 The Chamundeswari Temple and Mahabaleshvara Temple are at the top of the hill. There is also a humungous statue of Mahishasura at the entrance to Chamundeswari Temple - it features Mahishasura holding a sword in his right hand and a cobra in the left. 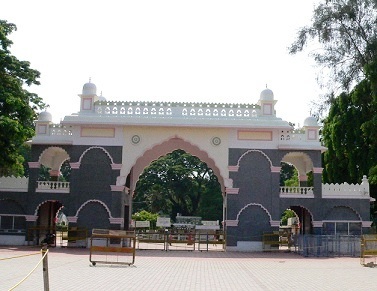 Rajendra Vilas, the summer palace of the royal family is nearby although it is currently out-of-bounds to tourists. We got back in the city around noon and had lunch at RRR, a low-key restaurant next to Parklane Hotel - their Thali lunch is pretty good. 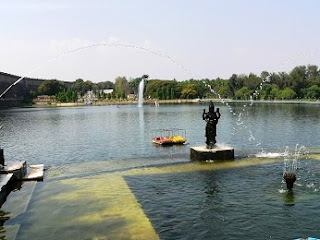 Brindavan Gardens is around 20KM North-East of Mysore on a lake and dam area across the Cauvery River. There are plenty of buses running that route from Mysore city - get in any KSRTC bus that go via KRS. Krishna Raja Sagara (KRS) reservoir is next to Brindavan Gardens and the name KRS is more familiar to locals - so, for directions when visiting by car, it is best to ask for KRS rather than Brindavan Gardens. 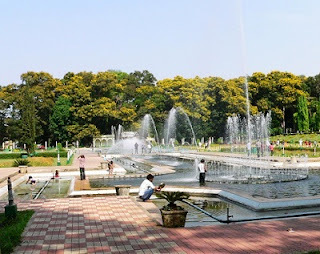 Our childhood memories of visiting Brindavan Gardens had etched an image of experiencing the most beautiful garden we had ever seen. In this regard, the experience this time around was rather disappointing. The picturesque setting is just as we imagined, but upkeep is sorely lacking. Also, there is a lot of local crowd that make it a very loud public play area. The park is open from 6:30AM to 9:00PM and the gardens are lit M-F 7:00-8:00PM and S-S 7:00-9:00PM. Curiously, video recording is prohibited in the gardens, definitely a legacy restriction that is still sticking due to slow government action. Cauvery Irrigation Department, a Government of Karnataka enterprise is responsible for maintaining the place. 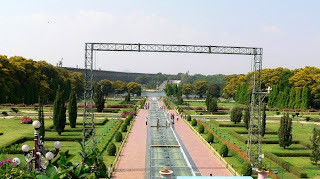 The main garden area is spread on 60 acres and is designed in a Mughal style in a terraced fashion. The distinct features of the garden include topiaries (mainly animal designs created from clipping shrubs), musical fountains and the lake with limited boating facilities. The gardens also feature 75 acres of fruit orchards and two horticultural farms on an additional 35 acres. The Arabithittu Wildlife Sanctuary area adjoins the gardens and it attracts a large variety of local and migrant birds. One option when visiting Brindavan Gardens is to go for an overnight stay at Royal Orchid Heritage Hotel that overlooks the garden - the rooms have a balcony with stunning views of the garden. The hotel rates are fairly high (Rs 6,500 onwards) and service and upkeep are not up to the mark, but overall, the location makes up for a lot of the shortcomings. 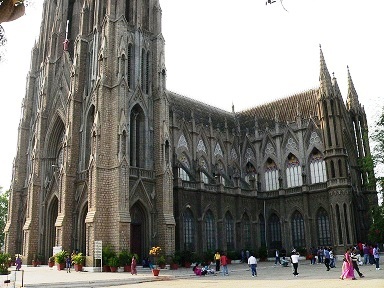 St. Philomena Church is located within the city and is on Asoka Road. It is around 2KM from Parklane Hotel on Harsha Road. We stopped by Mahalaxmi Sweets on the way (Asoka Road) to load up on Mysore sweets - it is a great gift item. 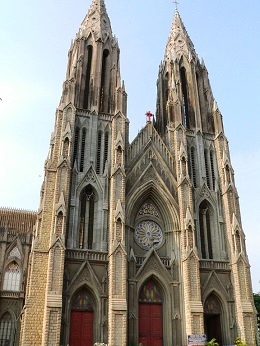 The church constructed in 1936 has an impressive Neo Gothic style that was inspired by the Cologne Cathedral in Germany. It honors Saint Philomena, a martyr of the Roman Catholic Church. The church hosts a relic of the saint in a catacomb below the main altar. A distinct feature of the church compared to the Cologne Cathedral on which it was based is the incorporation of local culture into the designs - female statues are dressed in saris! The Neo Gothic design is well represented in the main structure with twin spires, each reaching a height of 175ft and the main hall featuring stained glass windows depicting scenes from the birth, Last Supper, Crucifixion, Resurrection, and Ascension of Christ. The church is open to visitors from 8AM to 5PM. 1. 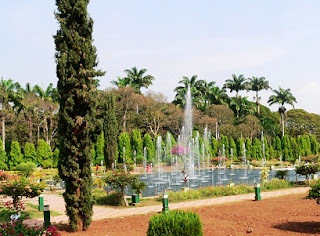 Mysore Trip Report - Palace and Zoo. 2. Mysore Trip Report - Chamundi Hills, Brindavan Gardens, St. Philomena Church.